Videos are all the rage at the ShareFair 09. So it was an interesting experience facilitating a Video Presentation this afternoon. Three colourful videos that tell stories about innovation (Karim Hussein, Caroline Bidault and Chiara Calvosa from IFAD), best practices (Stefano Gavotti from FAO) and traditional knowledge (Frank Bertelmann from GTZ Bolivia with IFAD). Participants were engaged even though one of the videos was in French, which only goes to show that language is no barrier (well, almost). Discussions focused on lessons learned and upscaling of such videos. Two of the videos featured contests held in Bolivia and Burkina, and the presenters shared their insights on the behind-the-scenes activities. Caroline noted that sharing occured willingly between contestants while Frank felt that impact monitoring of large-scale international contests was definitely a challenge. Altogether an interesting KS experience for me. In this video Steve Song explains the most important points of his presentation for the Knowledge Management, Education, and Learning (KEL) Workshop in Maputo. The increasing density of connections in the world changes the way we work, the way we think in a fundametal and qualitative way. I will talk about why that is true and what impact that may have on people and organizations. Steve also shows us the “Flip”, which is an ultra-simple video recording gadget, which is relatively inexpensive and requires no extra editing software, nor cables. He thinks it is important for allowing people with other types of literacies to take part in knowledge flows. He explains how You Tube is important. In this video Prof Adipala (RU FORUM) explains the most important points of his presentation for the Knowledge Management, Education, and Learning (KEL) Workshop in Maputo. “The main thrust is that for Africa to participate in a global knowledge economy, it must have a critical mass of well trained human capital and that is grossly lacking. I will explain some of the new needed interventions. The Consultative Group on International Agricultural Research, or CGIAR, is facing unprecedented challenges. Today, rural communities across the developing world are suffering from sky rocketing food prices, the grave threat of climate change, energy shortages and unstable global financial markets. To continue to be relevant, the CGIAR has to adapt to the changing times and this video is about the revitalization process which is currently underway. This video has been produced by the Institutional KS Project as a contribution to the socialization of the CGIAR change process. The script was done in collaboration with the CGIAR Secretariat. The multimedia was produced by a CIAT team and the original video style idea is from The Common Craft Show who kindly authorized us to use it. Short and Sweet: A ‘Storymercial’ by WorldFish. As announced in a previous blog post, WorldFish delivered it’s storymercial, a short and punchy video that aims at attracting investors, partners and media to support research and apply its outputs. WorldFish now shares this innovative KS approach through a “how to” guide. View the two-minute storymercial Fish for life: Rehabilitating lives after natural disasters. The Pilot Project run by The International Centre for Agricultural Research in the Dry Areas (ICARDA) is focused on research/researchers recognizing the value of farmer knowledge, getting farmers to value their own knowledge and ideas, and finding ways to share farmers’ and other sources of knowledge between farmers. The main activity of the Pilot Project revolved around the organizing of an International Farmers’ Conference. Over 50 farmers attended this conference of a different kind. Instead of being passive participants, listening to presentations by researchers, the farmers were instead asked to present their situations, knowledge, experiences, ideas and skills using storytelling. 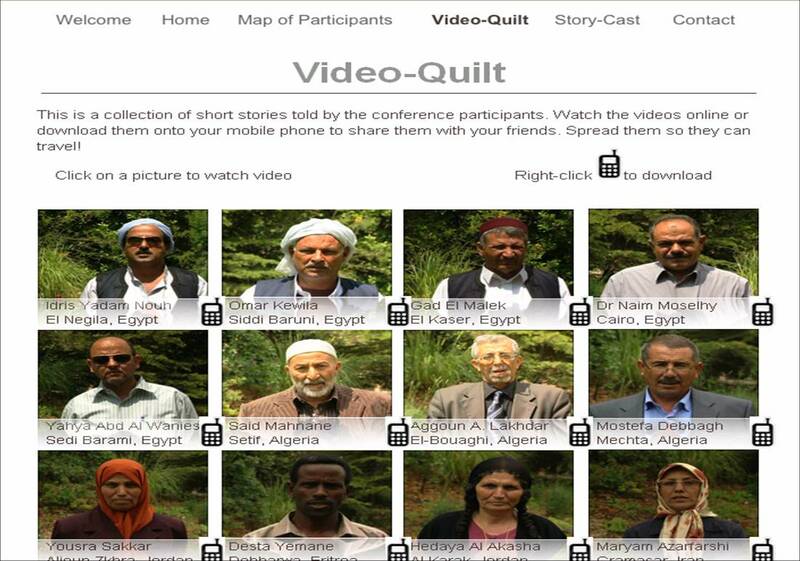 The stories of the farmers were recorded in video, audio and text forms to be disseminated in various ways. All will be made available on a Conference website to be launched soon. Additionally the conference organizers uploaded small story clips onto mobile phones of farmers present and showed them how to send these to other farmers with mobile phones. This was done to stimulate some knowledge sharing and a sort of farmer-to-farmer extension system to help facilitate the spread of useful ideas, techniques and knowledge around agricultural activities, specifically plant breeding. 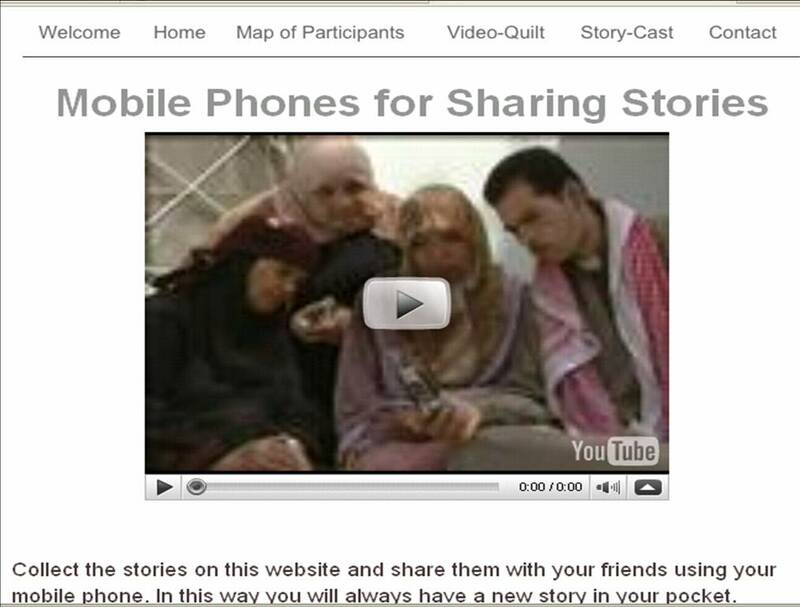 A small video clip was made to show farmers how to share the stories with each other and other farmers. This and other video clips will be available on the website. Yes this technology exists and works in Syria and some of the other countries involved! No it doesn’t work for everyone-that is true.